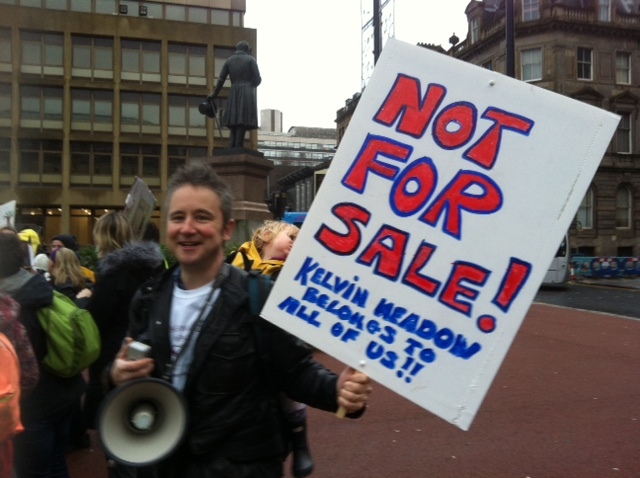 Our local community in North Kelvin, Glasgow,UK, has been campaigning for years to preserve a precious piece of wild land in the middle of the area. The most recent initiative, The Children’s Wood, has won numerous awards in its three years of activism. It operates on the cutting edge of world-wide research which shows that children – and their families – enjoying the Great Outdoors together is wonderfully effective in promoting physical, mental, and community wellbeing. Our local wild space is regularly used all year round by numerous community groups, eg a number of local schools are now on side with an impressive range of educational programmes centred on outdoor learning. This year, the Charity Commission recognised The Children’s Wood by awarding it charitable status, to the delight of all local residents. You would think, wouldn’t you, that our local City Council – which likes to promote Glasgow’s “Dear Green Place” image – would be proud of having such an impressive community initiative right here. You might even think, mightn’t you, if they were savvy politicians, that they could be claiming some of the credit for this world-class initiative, using its success to attract positive interest – maybe even money – in promoting their Glasgow’s Green Year 2015 campaign? Not a bit of it!!! “Glasgow City Council is run by a Labour administration. It is the decision of the Labour party to sell the land. They could at any point throw out the application on various grounds, including the length of time it is taking New City Vision to move forward. It has now been 7 years since New City Vision became the preferred developers, and 3 years since the initial planning application was submitted. In the mean time the community of Maryhill and North Kelvin have been kept hanging around while NCV stop and start. The Children’s Wood have just made a short film which weaves research, activism, and images of children and adults using the land, into a vivid and clear statement of commitment to an ongoing project which can be used as a template ANYWHERE in the world where there are wild spaces within cities. Such spaces are in danger of being swallowed up by the power of commercial interests, who cannot see benefit except in terms of money. We are challenging this attitude in our community. We need help and support in fighting against our own City Council, sad though it is to have to see this statement in cold print. If you would like to give us a donation to help fund our campaign, as well as our ongoing community projects, click HERE. Thank you for taking the time to read this post. Do leave a comment with your thoughts.